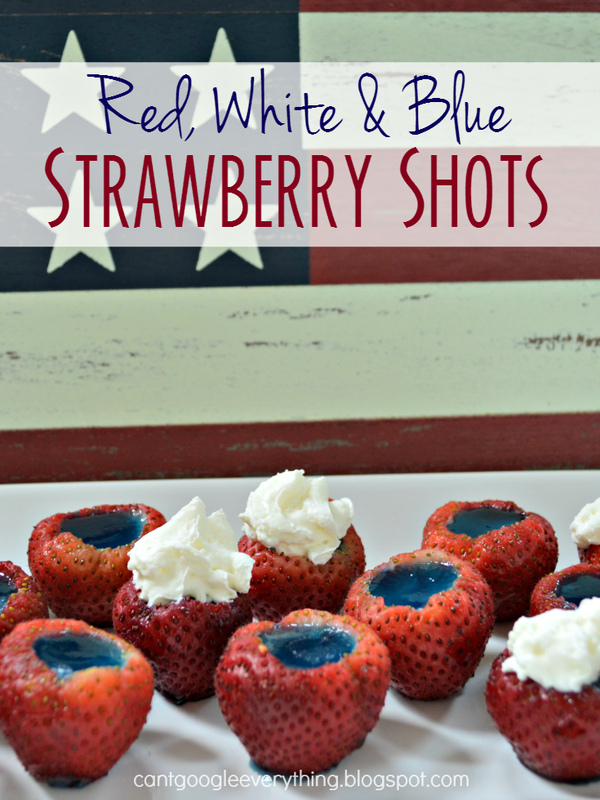 Red, White & Blue Strawberry Gelatin Shots! With the 4th of July right around the corner, I wanted to try my hand at creating a new red, white and blue gelatin shot recipe! These shots are fun and different, not to mention absolutely delicious! Don’t worry they have been thoroughly taste tested and I can say with confidence they will be making a grand debut at our big fireworks party this year! For the easy directions, watch the video below, or scroll down for the written version! Cut the bottom off each strawberry so they stand up strait. Take off the leaves and then use the scooper to scoop out a bowl in each strawberry. Set aside. Mix 1/2 cup boiling water with the jello and stir well until fully dissolved. Add the 1/2 cup vodka (I use whipped cream flavor) and stir. 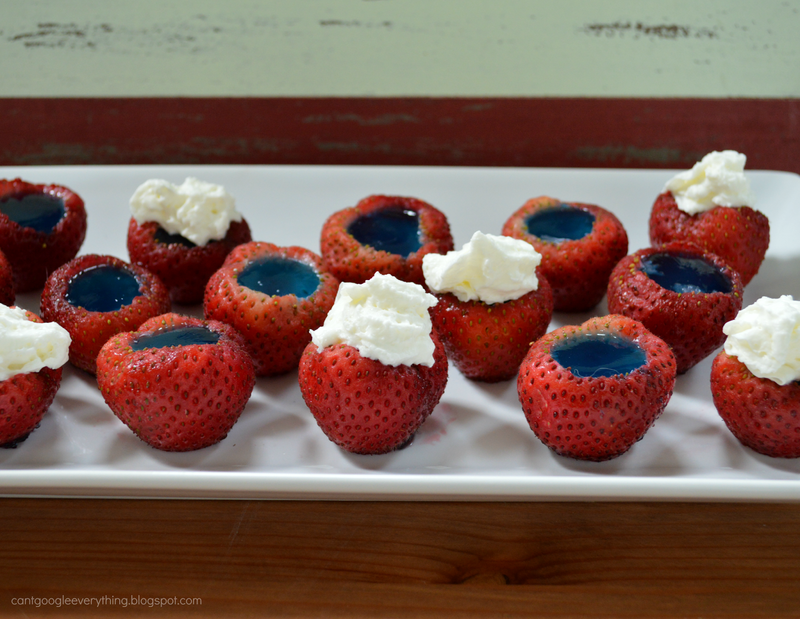 Carefully pour the jello into the strawberries. Transfer to fridge to set, about 4 hours. Top with whipped cream before serving! So pretty and patriotic! 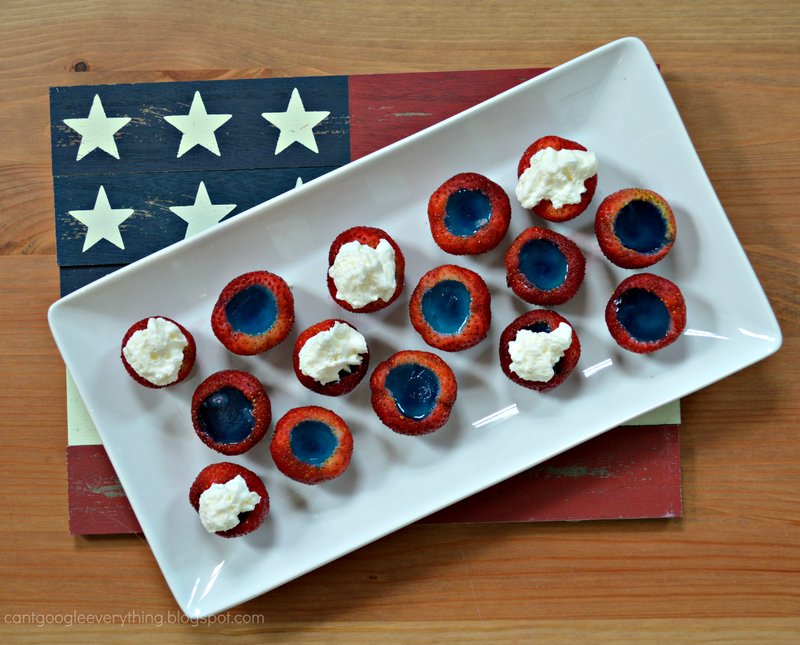 The perfect treat for your 4th of July party this summer! You can also make them sans alcohol for this kids! Will you be making jello shots for any parties this summer? What’s your favorite cocktail? If you liked this one be sure to check out a few of my other gelatin shot recipes! Well these are fun! 🙂 Great party idea, Rachel! These look delicious. I would be on the floor because I love strawberries and would want to eat the whole plate. These look delicious. I would just make them to have at home. It'd be a lot of work to have a party's worth with my friends & family. Your teeth look so blue in the video towards the end 🙂 Of course, maybe it's my dim screen but it made me laugh! What a cute and yummy idea! I love that these are in strawberries! Great idea! They look delicious! Yum! Pinning to my Fourth of July board! These are awesome!! I think my little cousins would love them at our picnic (minus the alcohol!). Also I loved the vlog! You're so brave! I've been thinking about doing one for awhile but I haven't mustered the courage. Ha! Oh my goodness…. These look so yummy, I can't wait to try these! Have you ever tired doing it with rum instead of vodka? Not really a big fan of volka. These look so yummy and easy! Great use for the strawberries we picked!! Oh my gosh these look so cute AND so delish! Jello shots are the best thing for a refreshing and fun summer treat. For memorial day weekend, we set the jello shots in lemons/limes. I am loving this post!